Wow….and well…”Wow”. Stonework and all…. 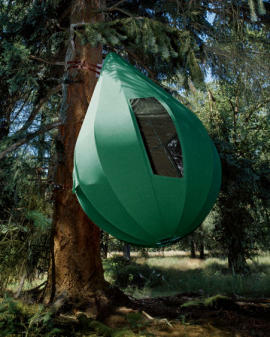 Forget the kids, I want to live in this thing! These kids must have a blast in this thing! A+ for you, Dad. Its been awhile since I posted, since I’ve been VERY busy since my book and other blog http://www.relaxshacks.com was featured on NPR….but thought some of you might appreciate/dig this video here…. Scrappy n’ Crappy- The Way We Love It! 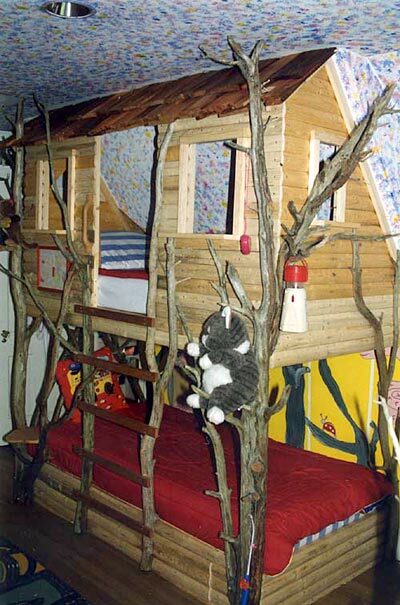 Here’s the work of Nick McGlynn- a salvaged wood treehouse, that he began in 2000. Not too shabby, er….REAL shabby, but that’s the whole charm of it. 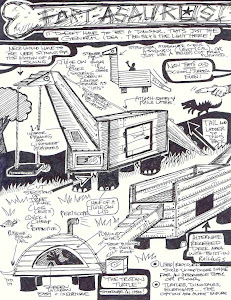 THIS is what treeforts/treehouses should be all about. Great work Nick! Got Forts? My indie book- Out Now! My main blog (book-based, as is the tied-in tv show I host “Tiny Yellow House” on youtube), has a ton of info on this book, which was released in January, but since this blog is ESPECIALLY fort related, I figured I should at least post mention of the book’s existence here as well. Trash funded (the first printing run), hand assembled, and each copy comes signed. $17.95 each (which already includes shipping, etc). Paypal id: senorsell@hotmail.com, or head over to http://www.relaxshacks.com for snail mail (check, mo, cash) info. 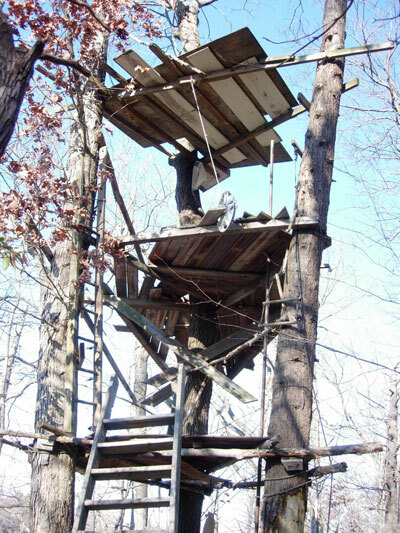 Not so much a fort, but it could be…. 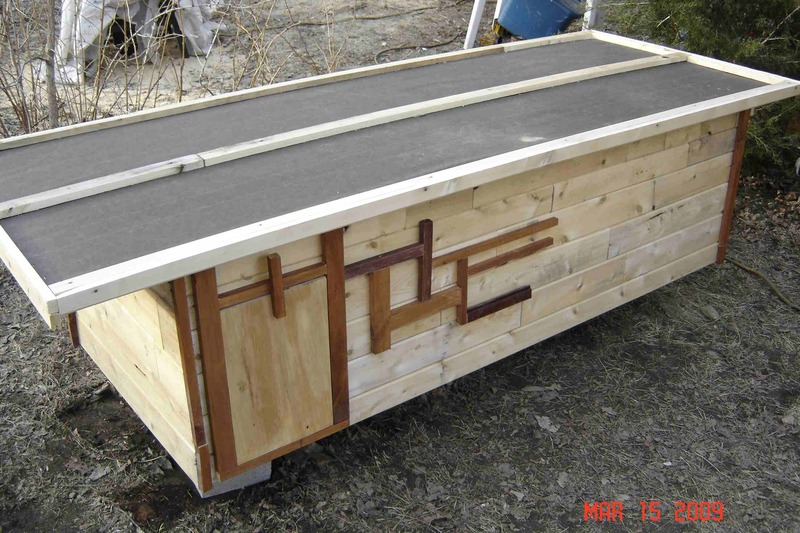 I was going through my old photo files today and came across this pic of a salvaged and recycled-material chicken coop that I built about two years ago. "the stained scraps (woodworking leftovers) were added to give the coop a little design/flair (somewhat of an Asian one, perhaps). Ultimately someone bought it, but for use as shelter for his dwarf goats! Hey, whatever works…. Anyway, with a little enlarging (note: a front stereo-glass (salvaged) window was later added), this boxy design could make for a very simple playhouse or treehouse/treefort. 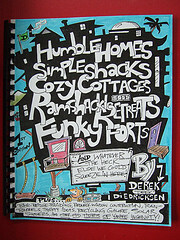 Some similar designs (TONS of ‘em) also appear/are sketched out in my indie-released book “Humble Homes, Simple Shacks, Cozy Cottages, Ramshackle Retreats, Funky Forts (And Whatever The Heck Else We Could Squeeze In Here” – through Tiny Yellow House Press and available through http://www.relaxshacks.com for $15.95 (includes shipping). "Here's a shot of the book (hand colored by a purchaser/fan of the book)"
Anyway, the idea’s still great, and the hokey-ness factor is high! Love it! As for my book, its received AWESOME/rave reviews and/or coverage in newspapers, tv shows, magazines, blogs, websites, and more, from the likes of….Lloyd Kahn, Katherine Sharpe at Readymade Magazine, Make Magazine, Mimi Zeiger (author of “Tiny Houses”), The author duo of David and Jeanie Stiles, Gregory Johnson of the National Small House Society in Iowa, The Energy Bulletin (.net), Michael Janzen at tinyhousedesign, Kent Griswold at Tinyhouseblog, Jay Shafer of the Tiny Tumbleweed House Company (for my book-related tv/online show “Tiny Yellow House” on youtube), The Stoughton Journal in Stoughton, MA, The Source in Madison, CT, and many, many, many more. (Thank you ALL, so much!). The book was just picked up for sale at the legendary BREAKWATER BOOKS in historic Guilford, CT too! 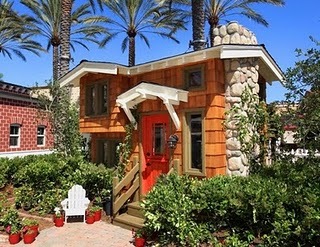 Granted, its a cool-looking little structure, which apparently has hardwood flooring within and a round mattress that sleeps two adults, but, who in their right mind, EVEN IF SO WEALTHY, would spend 50 large on something so Coleman-tent looking? I initially saw this photo and thought “Aw, that’s kinda neat- what’s it cost? $600 or so? Nope. Apparently ya’ gotta be a giant dope (or dope dealer) to get one of these. And as for his kids, whatever happened to giving’ ‘em a hammer, box of nails, and some scrap wood to build their own creation? I GUARANTEE they’d appreaciate, and use it, ten times as much. AND….$50,000 spent on a hanging tent that looks like a….well, you know…..I mean c’mon- there are a TON of good charities that could have used that money if you’re just gonna blow it like that. Sad. Design-wise, a decent idea though (which coleman SHOULD steal and sell affordably!). 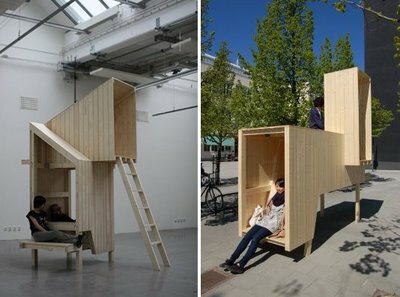 Cubism meets kids forts/treehouses? Or just a bizarre adult reading structure? Just think of the pats on the back, and the resume boost you’ll receive when you tell your prospective employer that YOUR handiwork and photo submissions were featured on WHOFORTED.com! Today’s the site kick-off of http://www.whoforted.com (bottle of champagne crashes against my computer….many papertowels later, typing resumes…)! 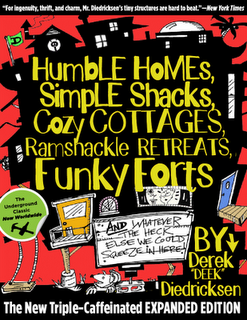 Anyhow, My main small housing/cabin/shack/fort/treehouse blog and site is http://www.relaxshacks.com, but this side project is the early beginnings of a subsequent fort-related book I hope to release at some point down the road (Once I’m finished on the follow up to my indie book “Humble Homes…” (see the righthand column of THIS blog page- soon))- which is well on its way. 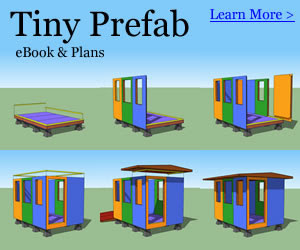 I’ll be posting some of my findings on this site, naturally, but I’m looking for childish, hokey, character-laden forts, hideouts, treehouses to post on- that just might serve as a creative spark for some adult oriented architectural conversions! Ya’ never know! 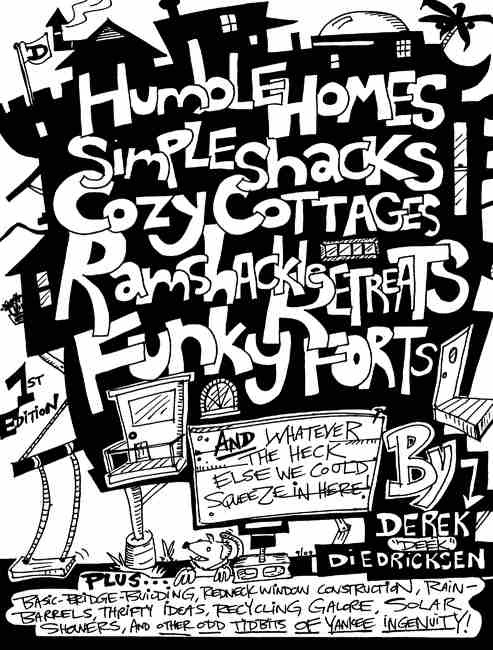 So….YUP, I’m looking for cool and original photos of ramshackle, down-home, forts- the hokier, the better. Wacky blanket forts, salvaged-material huts, and so on…. You can email them to kid cedar at gmail dot com- and who knows, yours just MAY make the book, down the road!